This is “Web Exercises”, section 4.6 from the book Beginning Project Management (v. 1.1). For details on it (including licensing), click here. Locate and analyze information online related to managing client relationships. Locate, download, and analyze a project milestone analysis and then create your hypothetical project milestone analysis for distribution to your team and client. Managing relationships with clients is a challenging task, and it is often discussed online. In this exercise, you locate online articles and other publications dealing with client relationships and then compare and analyze them. Start a web browser program and go to the an idea website at http://anidea.com/etc/how-to-create-a-cooperative-relationship-between-account-and-project-management. Review the five topics listed in this article. Start a word processing program and open a new document. On the first line, type your name. Below your name, write a brief summary of the points made in each of the five major topics. Save the word processing document as Ch04ClientStudentName using the Word 2003 .doc file format. In the web browser, use a search program such as Google to search for a combination of key terms such as Project Management Client Relationships. Review the results of the search and choose a site that addresses some of the same points. Consider the similarities and differences between this site and the article from an idea. Copy the web address from the browser’s address bar. Switch to Ch04ClientStudentName. Paste the web address into the document. Switch to the browser. Capture the screen and paste it into Ch04ClientStudentName. Below the screen image, compare the content of the two sites point by point using a separate paragraph for each point. Be specific. If the site does not address one of the five points in the first site, briefly mention that it does not. Save the file and submit it as directed by the instructor. Close all documents and programs. Project Milestone AnalysisWritten by Eric Ouellette as his additional project for graduate credit, December 2010, Eastern Michigan University. Edited by Professor Preston on June 20, 2012. Morale and psyche are an important component in any project; this includes both the team and the client. Project milestones represent significant events within the project. Some project milestones signify external events that provide critical information or resources to the project or an external event that requires information or deliverables from the project. Nonetheless, the proper creation and distribution of this information can be an integral part of the overall success of your project. Open a blank word processing document and type Milestone and your name and date on the first line. Save the file as Ch04MilestonesStudentName using the Word 2003 file format that ends with .doc. Start a web browser program and go to the Orion Crew Exploration Vehicle Project Milestones page for NASA at http://www.nasa.gov/pdf/479023main_Orion_2010_Milestones.pdf. 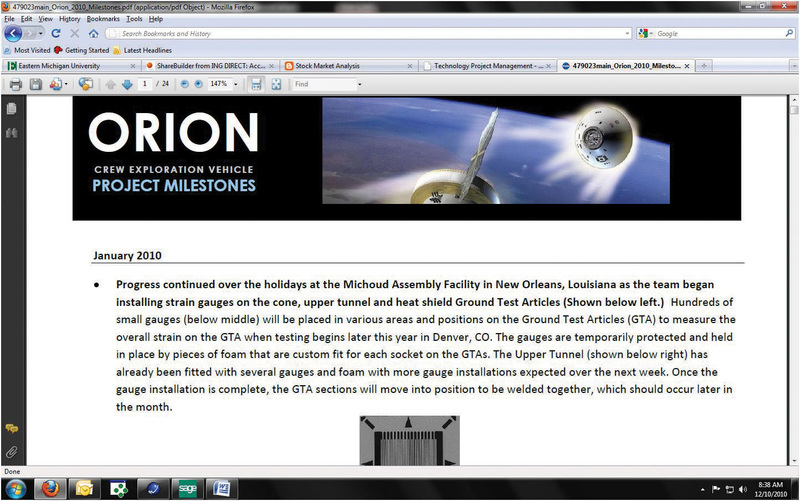 A screen capture of this milestone analysis is shown in Figure 4.9 "Orion Milestone—NASA". Add this website to your browser’s favorites list, in a folder named Milestones. Capture a screen that shows a link to this site in the Projects folder of your bookmarks or favorites and then paste it into the word processing document. Within the PDF file locate the milestone attribute within the analysis that you feel to be most significant, capture the screen of that milestone accomplishment, and paste it in the Word document. Below the Word document, include a brief summary (250 words) as to why you think this accomplishment is of merit and utilize references from the reading in Chapter 4 "Understanding and Meeting Client Expectations" to correlate this accomplishment to things you’ve learned in the text. Describe the advantages of using project milestones. Now that you have familiarized yourself with the reading on the importance of project milestones and witnessed a firsthand account of a project milestone analysis on behalf of NASA, create your hypothetical 1,000-word milestone analysis document including a minimum of four digital images. Make sure that the analysis is pertinent and consistent—maintain a common theme. Use appropriate verbiage that will be comprehendible by everyone who may read this analysis: team members, clients, and so on. Insert this 1,000-word analysis with imagery below the final screen capture from the NASA website. Save Ch04MilestoneStudentName and submit it as directed by the instructor. Close all documents and programs.